Sally doesn’t feel like a good pally to Coco in the Bold and the Beautiful spoilers. 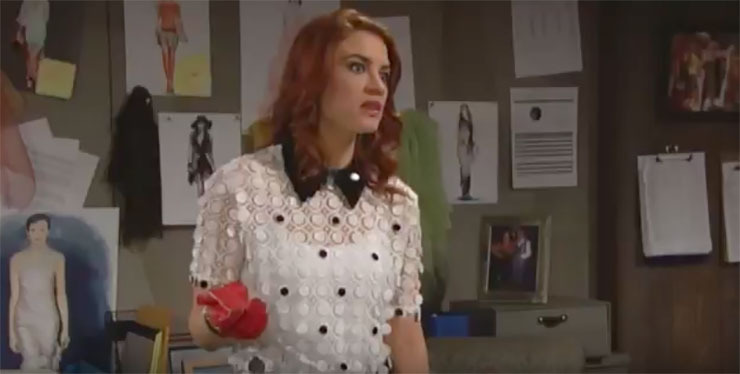 Bold and the Beautiful spoilers for Wednesday March 8th, predict that Sally is not pleased with what she and her Spectra cohorts are doing to Coco. Sally (Courtney Hope) tells Saul (Alex Wyse) the reasons she feels uncomfortable making Coco (Courtney Grosbeck) an unsuspecting spy for Spectra fashions using her position as Forrester’s newest intern. Shirley says that Coco’s saving RJ (Anthony Trupel) had to count for something. And it did cause the Forresters, even the most doubting ones, to warm up to her. Despite her misgivings, Sally gives Coco the spy jewelry to wear, so the Spectras can know everything that’s going on over at their competitor. Meanwhile, RJ calls his his new friend who saved his life to thank her. Awww–someone’s got a crush! And we think it’s returned. These two really are daytime’s current answer to Romeo and Juliet, being from feuding families and all! Ridge (Thorsten Kaye) gathers his team around him to tell them of some very special impending events. One is his marriage to Brooke (Katherine Kelly Lang), and another is a show/s they’ll be putting on. And guess where all of these events will take place? Australia! Cast photos of the show’s Australian location shoots have included Heather Tom (Katie Logan), so she’ll likely be part of the festivities. Of course, rumor also has it that Katie will be the one to blow the lid of Ridge and Quinn’s (Rena Sofer) affair. Will it happen just before Brooke and Ridge say, “I do,” in classic soap fashion? Only time will tell!